CNBC's Jim Cramer shares his outlook on the week ahead and tells investors how he thinks the market could regain bull status. The "Mad Money" host has his eye on the Fed, the trade war and earnings from the big banks. The stock market was due for this sell-off, but the Federal Reserve certainly had a hand in kickstarting the pain, CNBC's Jim Cramer said Friday as the major averages tumbled. "That's exactly what happens when the chairman of the Federal Reserve tells us he may need to overshoot with his rate hikes to ensure inflation is kept in check," the "Mad Money" host said. Cramer was referring to Fed Chair Jerome Powell's Thursday comments on being "a long way" from neutral in terms of interest rates, a sign that the central bank was serious about its planned future rate hikes. "It's going to be hard for stocks to stabilize until he walks back those comments, or at least clarifies that he's going to make his decisions based on the data rather than giving us a series of lockstep, autopilot rate hikes that the economy, as strong as it is with these employment reports, may not be able to handle," Cramer said. And with the Labor Department's latest nonfarm payroll report showing lower job creation than many expected, Cramer said a bit of wage inflation wouldn't be as detrimental to the economy as the Fed seems to think. Still, he admitted that the Fed wasn't the only force putting pressure on stocks. The U.S. dollar's strength, higher bond yields and climbing mortgage rates all contributed to the declines, he said. "I see housing, autos and now, after this week, maybe even retail slowing, so it's entirely possible the Fed is ahead of the curve already when it comes to stamping out inflation," Cramer said. "In the end, there's only so much they can control, and these three industries really tell us that the rate hikes are already working like they're supposed to." Cramer expects President Donald Trump to announce another wave of tariffs on Chinese goods as soon as Monday in response to a report from the Pentagon saying China represents a "significant and growing risk" to military product manufacturing. "It's an escalation of the trade war and I bet the president escalates right back," the "Mad Money" host said. "So be prepared for some tough talk when we come in Monday. That should send many of the industrials that rallied earlier this week on hopes that China could capitulate to Trump the same way Mexico and Canada have ... back down." J.M. 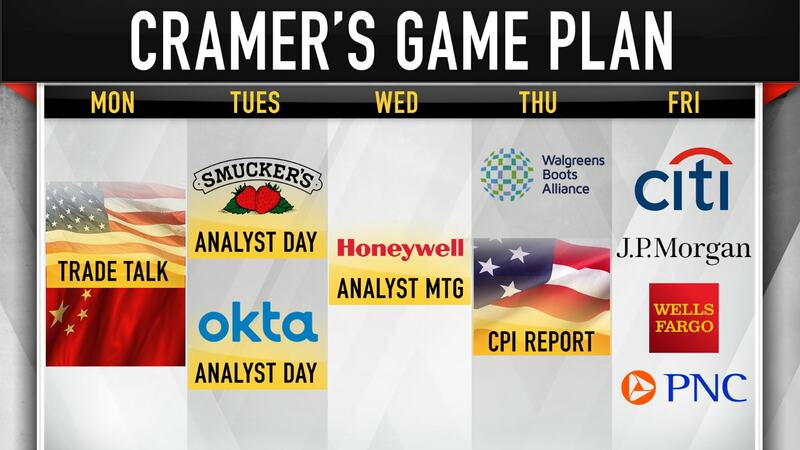 Smucker: An analyst day at the maker of Smucker's and Crisco should reveal a lot about whether investors think the Fed will really push the U.S. economy into recession, Cramer said. More importantly for investors of Smucker, "We need to know if this fine company is going to get back on track, something that many people say is not going to happen anytime soon," he said. "Smucker's had a rough go of things — the stock's down 17 percent for the year. Let's see if management has a plan to re-energize the business," Cramer continued. "If they don't give you one and it rallies anyway, what that says is money managers are afraid of a recession." Okta: Cramer will also have his eye on an analyst meeting at this cybersecurity software company. "This is one of those high-flying tech stocks that's having a real rough go of it right now," he said. "When the sell-off stops, I think it could be worth owning, but Okta ... is up more than 150 percent this year, so it could go a lot lower before it starts going higher again." Honeywell: An analyst meeting at industrial giant Honeywell will reveal more about the company's plan to spin off Resideo Technologies, its home technology business. "This is not the time to own a housing-related stock, ... but it is a good long-term bet and the Honeywell spin-offs have worked," Cramer said. Walgreens: The second-largest U.S. pharmacy operator will report earnings on Wednesday, but pressures on the retail industry brought about in part by Amazon are starting to worry Cramer. "However, I like what its rival CVS has been up to with the Aetna merger. I'd like to see Walgreens announce something similar when they report," he said. CPI: Inflation worries could come to a head on Thursday when the U.S. Bureau of Labor Statistics releases its consumer price index, a measure of the average change in consumer prices over time. "If this one does come in hotter than expected, we're going to hear a lot of chatter about how the Fed is right to overshoot with its rate hikes because that's how you stop inflation in its tracks," Cramer said. "On the other hand, we get a tame CPI number. That could be exactly what you would need [for] the market to bottom on that report if it hasn't bottomed already." Friday: J.P. Morgan Chase, Citigroup, Wells Fargo & Co.
Banking giants J.P. Morgan, Citigroup and Wells Fargo issue their quarterly earnings reports on Friday, and Cramer expected "decent" results. "Now, I don't believe the banks can blow away the numbers because long-term interest rates haven't kept pace with rising short-term rates. That crimps their net interest margins," he explained. "However, those long-term rates surged this week — the 10-year Treasury's now at 3.2 percent — and that means the future's for all of these financials is brighter than it was a week ago." He expected J.P. Morgan to muse on the strength of the economy, Wells Fargo to insist that customers were returning after its series of scandals, and Citigroup to address how Trump's trade revisions could affect its Mexico business. "Bottom line? We're going to try to put in a bottom next week with an oversold market and hopefully tamer interest rates and cooler inflation," the "Mad Money" host said. "That said, the Federal Reserve has gone from a tailwind to a full-on tsunami of a headwind for the stock market, and the market won't give us a sustained comeback unless they get a little less hawkish and more data-dependent like the Fed of recent yore." Disclosure: Cramer's charitable trust owns shares of Amazon, Honeywell, J.P. Morgan Chase and Citigroup.